Get the scoop on what’s trending now and what’s soon to hit the scene. Here’s a list of some of Austin’s best new food, nightlife, shopping and more. Austin’s culinary star continues to shine with these new and upcoming restaurants you’ll want to add to your list. Eberly Austin. Credit Merrick Ales Photography. Opened fall 2016, downtown’s Red Ash Italia is quickly climbing “best of” lists for its creative takes on Italian classics, many grilled over a fiery plancha. A few blocks away, Wu Chow is packing ’em in with eclectic Chinese cuisine, weekend dim sum service and Tiki cocktails. Butter coffees and bone broths top the innovative menu at paleo-focused Picnik, which opened its doors in North Austin. L’oca d’Oro (translation: “golden goose”) in Mueller may look unassuming, but the house-made pastas – like the soon-to-be-legendary wood-roasted mushroom lasagna – are gaining a following. Inspired by Tulum, colorful Grizzelda’s blends Mexican tradition and Texas heritage, with prime meats sourced from the family farm of owner Adam Jacoby (of Jacoby’s Restaurant & Mercantile). 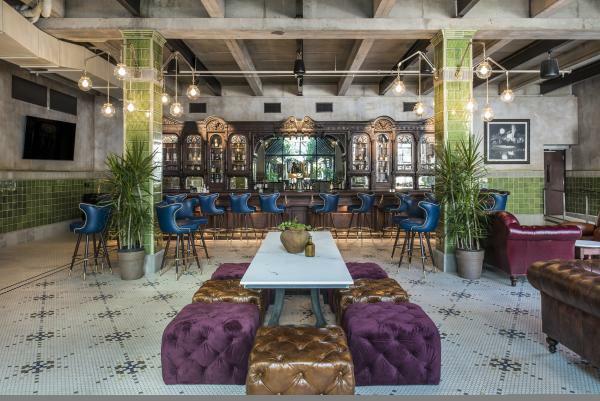 Two revamped industrial spaces house a pair of Austin’s hottest dining spots. At the former Seaholm Power Plant, Boiler Nine serves wood-fired fare and curated beers across three levels, including a rooftop and a “subterranean cocktail laboratory.” Inside an old print shop on South Lamar, Eberly specializes in contemporary American cuisine (think steaks and oysters), but the jaw-dropping interiors – including a tavern with a cedar bar salvaged from a Greenwich Village drinking hole – are as much of a draw as the food. The food hall craze hits Austin in 2017 with Fareground. The design-forward hall will inhabit the lobby of One Congress Plaza downtown, offering an array of local food and beverage vendors. Two retro spaces, coming right up. A Clockwork Orange-themed Moloko pours daily drink specials amid psych rock in trendy East Austin, while Sellers is mixing craft cocktails in a swanky, ’70s-inspired lounge in Austin’s Warehouse District. With an expansive menu of Trappist beers and lambics, Mort Subite became Austin’s first Belgian beer bar in late 2016, while The Brewer’s Table will soon revive the tradition of wood-fermented beer (alongside seasonal, locally sourced food) in East Austin. Two new coffee shops go above and beyond basic caffeinated offerings. At Fleet, small-batch coffee is rounded out with experimental concoctions like the Saturday Morning Ritual – Fruity Pebbles-infused milk and espresso. Stonehouse Coffee + Bar has set up shop in the newly revived Dawson Stone House, a historic landmark building on South Lamar; open late-night, it serves Cuvee Coffee and pastries during the day and craft beer and wine after dark. After a seven-month, $3 million renovation, The Contemporary has reopened at the Jones Center on Congress Avenue. Boasting 7,000 more square feet of installation space, the museum also added a roof canopy which will house a new permanent installation, Jim Hodges’ With Liberty and Justice for All (A Work in Progress). The sixth edition of the Texas Biennial, lead by local non-profit association Big Medium, is set to return in 2017. Look for participating artists and event calendar coming soon. Domain Northside opened its doors in late 2016, creating an upscale shopping destination for North Austin. Tenants in this 600,000-square-foot complex include Nordstrom, Restoration Hardware, the Archer Hotel and a handful of local brands. Within Domain Northside, the newly unveiled Rock Rose district rivals downtown for entertainment options and local flavor, from creative cuisine at General Tso’Boy to late-night drinks and dancing at 77 Degrees. Another mega-development is taking shape, this one across town in South Austin. St. Elmo Public Market, a new mixed-use district set to open in early 2018, will house creative workspaces, a live music venue, hotel and the market itself, which will offer 50,000 square feet of retail space. Located across from Austin City Hall, 3TEN is the 350-seat sister venue to ACL Live, and hosts cozy, intimate performances. November 2016 saw the inaugural Sound On Sound, an eclectic indie music festival held in Sherwood Forest. Acts included Beach House, Run the Jewels and Phantogram, and the fest has plans to return on November 10-12 2017 (be on the lookout for tickets and performers). Experience some of Austin’s emerging theater voices at the sixth-annual Latino New Play Festival, which will be held February 25–27, 2017 at the Emma S. Barrientos Mexican American Cultural Center.